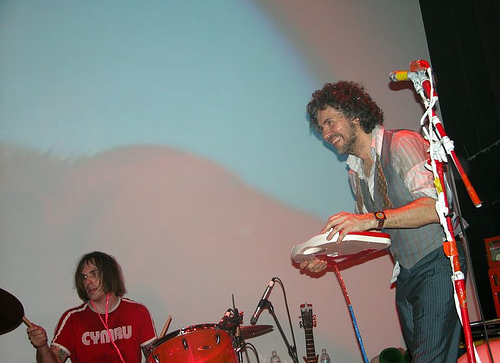 The new Flaming Lips album “At War With the Mystics” has some Circuit Bent Animal Farm action on it. 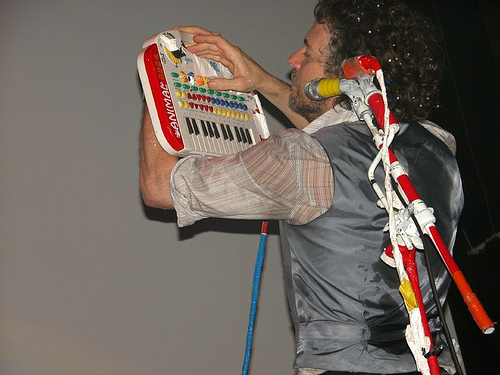 Wayne Coyne also posed with his keyboard ( Pictured Above ) for the Keyboard Mag‘s article on the new album. As a side note, Keyboard Mag has atleast one mention of “circuit bending” every issue that I get now. Wayne’s keyboard seems to have only one rather large silver knob controlling the pitch, but it would be most interesting to find out if he built the device or had someone else do it. Props will go out in either case. The lower images are from live performance and there are lots and lots more interesting shots of the Lips on Flickr from the current tour which looks to be buckets and buckets of fun.